The Ford Focus ST Exciting Technology Features | Randy Wise Ford Inc.
Why is the Ford Focus ST seen as a popular compact performance hatchback with motorists today? It might have a little to do with all the features inside this vehicle. 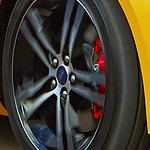 One of the features in the Ford Focus ST that is keeping all drivers on the road safe is the Electronic Brake Assist. When you need to bring the car to a stop to avoid a potential collision, this feature assists by giving you additional braking power. This feature can also monitor the road to help increase the braking distance to a car in front of you on the highway. Another feature in the Ford Focus ST making drivers safer is the Belt-Minder front safety belt reminder. With so many distractions around us today, never worry you and your passenger forgot to buckle up before hitting the roads. Stop at Randy Wise Ford Inc. today to test drive the new Ford Focus ST.